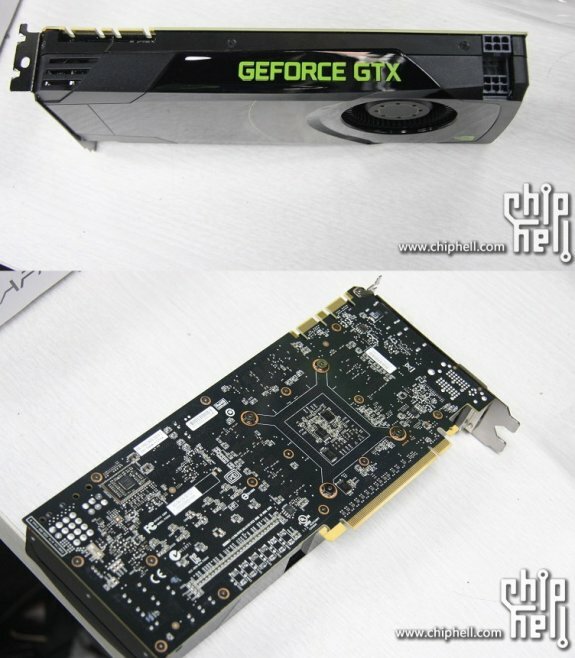 TPU discovered two more pictures of the NVIDIA GeForce GTX 680 at Asian tech site ChipHell. The card is expected to be released on March 22nd with a MSRP of $549. Courtesy of ChipHell we now have a couple of fresh pictures of NVIDIA's first Kepler-powered graphics card, the GeForce (or should we write' GeFORCE') GTX 680. Shot both from above and the back, the incoming card has a black PCB, a dual-slot/single-fan cooler, two (stacked) 6-pin PCIe power plugs, a couple of SLI connectors, and four display outputs - dual DVI, HDMI and DisplayPort.